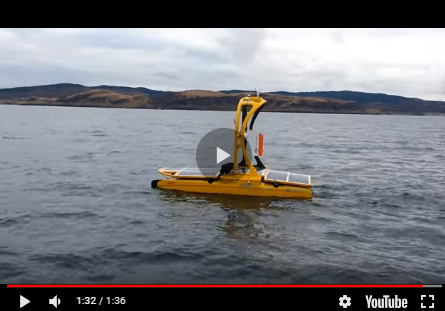 TerraSond, a hydrographic services company based in Palmer, Alaska (USA), used a C-Worker 5 (CW5) unmanned autonomous surface vessel (ASV) in conjunction with a 105’ (32m) research vessel from June through August 2016 on a major hydrographic survey in the Bering Sea region of Alaska. The ASV served as a force-multiplier, collecting multibeam and towed sidescan data alongside the larger vessel, which surveyed adjacent lines simultaneously. The 18’ (5.5m) ASV collected 2,275 nautical line miles (4,213km) – 44% of the project total – and achieved an industry first in terms of data production rates utilising ASV technology in the Arctic. Based in an Arctic region, TerraSond has long seen the potential benefits of using ASV technology on hydrographic survey projects. Much of the Alaska coastline is far from ports and requires expensive mobilisations of relatively large vessels and time-consuming transits to reach. Once the effort and expense of reaching a remote site is recognised, the potential benefits of deploying one (or more) unmanned vessels from the larger vessel to increase production is clear -- especially when work needs to be completed during the limited ice-free season. Along these lines in 2015, TerraSond deployed an ASV on a survey undertaken for the US National Oceanic and Atmospheric Administration (NOAA) in the northern Bering Strait. That effort involved a 12’ (3.7m) C-Target 3 ASV (CT3) military target drone, chartered from ASV, LLC of Broussard, Louisiana (USA) and retrofit for hydrographic data collection with a modest suite of survey instrumentation. Production was less than planned, largely due to the inability to safely deploy and recover the ASV in the highly exposed, inclement area. However, the experience brought lessons which were incorporated in the 2016 effort when NOAA again contracted TerraSond to perform a major survey in the Bering Sea region of Alaska, near Nunivak Island in Etolin Strait. Etolin Strait is located east of Nunivak Island in Alaska’s Bering Sea. Located near the southern edge of the Arctic ice pack’s maximum annual extents, the area is either covered by sea ice or experiences ice flows for the majority of the year. The area is therefore reliably navigable only from June through October. During the ice-free season the area experiences a flurry of navigation activity from barges, freighters, and other vessels as they transit through, bringing goods and fuel to locations further north along Alaska’s west and north coasts. The area also offers limited protection from the frequent storms of the region, where protection is scarce along Alaska’s exposed southwest coast. Existing charts here are incomplete or inaccurate, based on limited surveys dating to 1951 or older—a trait common of Arctic charts. This, as well as requests from mariners, led NOAA to prioritise Etolin Strait for a modern hydrographic survey. In fact, in June of 2016 the necessity of updating charts in the area was underscored when a 595’ chemical tanker grounded in the survey area on an uncharted shoal, just weeks before survey operations were scheduled to commence. Like much of Alaska’s Arctic coast, the area is remote, with fuel and supplies days away by water. The 105’ research vessel, the RV Q105, would need to be mobilised in Homer, Alaska – the ‘closest’ port to the survey area on the road system – and transit 900 nautical miles (1,667km) for four days to reach the survey area. The closest source of fuel and supplies was Bethel, a roundtrip transit of 600 nautical miles (1,111km), or about three days. Given the size and remoteness of the survey area, limited ice-free season, and inclement nature of weather of the region, it was important to maximise production for every operational day on-site. Utilising an ASV to effectively double production for relatively small additional cost made sense. To address the deployment issues experienced on the 2015 survey, ASV designed a custom Launch and Recovery System (LARS) for the CW5. The LARS is a dual-lift point davit system which allows the ASV to be deployed and recovered safely in conditions beyond that possible with a single-point lift, such as by vessel crane. Project requirements called for simultaneous multibeam and side-scan data collection. Therefore, ASV installed a multibeam-hull mount as well as a side-scan winch with a custom track/trolley system capable of deploying the side-scan tow fish and pulling it from the water again to be cradled and stowed on the CW5 deck when not in use. Following suitability testing and integration of TerraSond’s survey equipment into the ASV in Broussard, Louisiana, the ASV was trucked to Alaska. Arriving dockside in Homer — the ‘end of the road’ for the North American road system in Alaska -- the vessel was craned aboard the Q105, along with its supporting infrastructure and spares. The LARS system was welded to the Q105 deck and load-tested while the Q105 was mobilised simultaneously with survey and IT systems. Both the ASV and Q105 were configured with identical survey systems. Major components consisted of Reson 7101 multibeams, Edgetech 4200 side-scans, and Applanix POSMVs. Although the relatively large multibeam sonar head and side-scan tow fish were a challenge to integrate onto the small unmanned vessel, consistency across the two survey platforms utilised proven, familiar, and owned equipment, and more importantly allowed spares to be transferrable to either vessel if needed. Following sea trials of both vessels in Homer, the Q105 commenced the four-day transit to Bethel, where the survey crew would fly in to join it, and then an additional 1 ½ days to the Etolin Strait survey area, where operations would commence. Controlling and monitoring the ASV required an additional four dedicated personnel aboard the Q105 for 24 hour operations. This consisted (per 12-hour shift) of one ASV personnel to monitor the CW5-ASV and one TerraSond personnel to monitor the survey equipment suite. A fifth person from ASV was also aboard to assist with issues if needed, especially since the CW5 was a new survey platform for 2016. ASV’s proprietary ‘ASView’ software served as the command and control interface with the CW5-ASV, which maintained a telemetry link to the vessel at all times via IP radio with antennas mounted on the Q105 mast. ASView was used to send commands to the vessel, including what line to track, and monitor and control on-board systems. A streaming camera view was also monitored for obstacle avoidance and docking with the larger vessel. Survey systems were monitored by remote desktop methods over an independent IP radio system. Two survey PCs running on the CW5-ASV were monitored simultaneously over the radio link to monitor and control a combination of software packages including QPS Qinsy, Edgetech Discover, Reson 7k Center, and CARIS OnBoard. The CW5-ASV was operated in an ‘unmanned but monitored’ mode. In this mode the vessel was kept within visual range at all times while running a survey line adjacent to the line being surveyed by the Q105. Line tracking was automated, with the vessel able to maintain a distance off-track of 1 metre or better, even in poor sea states. Speeds were adjusted manually as necessary to keep the CW5-ASV at an optimum distance from the Q105, normally 500 – 800 metres forward to keep good visibility from the Q105 bridge. Line turns were completed by manual remote control and coordinated with the Q105 bridge. The ASV-CW5 side-scan tow fish was manually commanded to cable-in or cable-out as necessary to maintain an optimum height above the seafloor. Radio bandwidth was adequate for real-time monitoring and tuning of the acquisition systems but insufficient to transfer raw data, which could be as great as 50 – 100GB/day. Therefore, data was downloaded whenever the ASV was recovered aboard the Q105, which on one occasion was 3½ days after deployment. In fact, the need to fully QC and process the data was more of a limiting factor on deployment endurance than fuel consumption, which was estimated at 4-5 days. Though the CW5-ASV was primarily used to increase production, it was also used as the sole survey platform in particularly shallow (4-5m depth) portions of the area where it was deemed unsafe or impractical to survey with the larger vessel, which had a draft of 2m. In these cases the Q105 would follow the unmanned vessel to monitor it and keep it within radio range. Despite a relatively complex survey instrumentation suite that included towed side-scan, the CW5-ASV acquired 2,275 nautical miles (4,213km) of the project total of 5,200 nautical miles (9,630km) of side-scan and multibeam data, or 44% -- with the Q105 collecting the remainder. This production rate was much higher than the anticipated 30% and resulted in an on-site time savings of almost 25 days, allowing the project to be completed well ahead of schedule and during the optimal part of the Arctic summer. The LARS system was a large part of the success, allowing the ASV to be recovered and deployed safely in marginal sea conditions, with some recoveries taking place in seas of 6’ (1.8 m). Data quality compared well between the two vessels, with slightly more motion artifact apparent in the ASV-CW5 data due to the increased motion from its relatively small size. Line handling abilities were actually superior to the larger vessel even in marginal sea states. The successful deployment of the CW5-ASV on this project demonstrates the potential of ASVs to increase efficiency and productivity by operating concurrently with a larger survey vessel. TerraSond intends to continue to explore and deploy ASV technology whenever feasible, especially on its remote Arctic projects where increased production efficiencies are critical to decrease cost per nautical mile surveyed and make cost-effective mapping of the expansive, poorly charted Arctic region possible. Future plans may include deployment of multiple ASV platforms like the CW5-ASV off a single larger vessel to realise even greater production capacity. Thanks are due to NOAA for funding this work, ASV, LLC for providing, outfitting and managing the CW5-ASV, and Support Vessels of Alaska (SVA) for field deployment support on the RV Q105.